The Honorable Patrick J. Murphy is America’s first Iraq War veteran elected to the U.S. Congress and later served as the 32nd Under Secretary of the Army until January 2017. 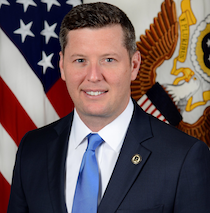 Secretary Murphy is currently the Distinguished Chair of Innovation at the United States Military Academy at West Point, an ambassador for the U.S. Chamber of Commerce Hiring Our Heroes initiative, a Senior Fellow at the Association of the U.S. Army, a media executive and on-air talent, and the Executive Chairman of The Workshop Mercantile, a professional education platform. As the Acting Secretary and Under Secretary, he led the management and operation of the Army—a Fortune 10-sized organization as the Nation’s second largest employer of over 1.3 million with a budget of $148 billion. His focus on dynamic business operations and transforming a more innovative and responsive workforce led to an expansion of the Soldier for Life initiative, which saved $340M in FY16, and reaching recruitment goals for the first time in five years with over 130K millennials hired. Secretary Murphy also facilitated unprecedented public-private partnerships generating over $250M in savings, from Major League Baseball to 20th Century Fox. His aggressive and authentic use of social media to tell the Army story helped lead to an 18% growth across all platforms. As a media executive he founded a production company, Taking the Hill, which creates television programming, films and digital content. His current projects include Unconquered (Epix, 2018), Almost Sunrise (PBS, 2017), Thank You For Your Service (Dreamworks/Universal Films, 2017), and a profile in When Trains Collide (PBS, 2017). Previously, Patrick was host and executive producer for Taking The Hill (2011–2015), and The Triumph Games (CBS Sports, 2015–2016). He authored the book Taking the Hill: From Philly to Baghdad to the United States Congress, (Henry Holt, 2008).